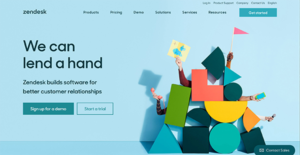 Zendesk lends to your helpdesk remote support capability so you can address customer concerns wherever they are, whatever channel they use and whenever they contact you. In a world where customers demand immediate attention, this software gives you that leverage to build a truly responsive help desk center that can resolve tickets, address queries, forward FAQs to knowledgebase and track issues whether you’re at the office or away. Behind its remote support capability is a suite of support apps that helps transform your customer service into agents for customer retention and lead source. It has one of the most flexible plan structures, making it ideal for business of any size. With Zendesk remote support capability, you can organize a global support network with agents located in your high-traction markets worldwide. That means being able to offer a truly 24/7365 customer service. Wherever they are based, agents are connected through the Zendesk system, enabling them to consolidate and collaborate on tickets just as closely where they were in the same room. An indirect benefit to a virtual helpdesk team, you get to access cost-attractive labor costs in territories where you operate; thereby, improving your bottom line. Each enterprise is different, and might call for a special Remote Support Software solution that will be adjusted to their company size, type of clients and staff and even particular niche they support. You should not count on getting a perfect solution that will be suitable for every company no matter what their history is. It may be a good idea to read a few Zendesk reviews first and even then you should keep in mind what the software is supposed to do for your company and your staff. Do you need a simple and straightforward service with just elementary features? Will you actually make use of the advanced tools needed by pros and large enterprises? Are there any specific tools that are especially beneficial for the industry you work in? If you ask yourself these questions it will be much easier to find a solid software that will match your budget. We realize that when you make a decision to buy Remote Support Software it’s important not only to see how experts evaluate it in their reviews, but also to find out if the real people and companies that buy it are actually satisfied with the product. That’s why we’ve created our behavior-based Customer Satisfaction Algorithm™ that gathers customer reviews, comments and Zendesk reviews across a wide range of social media sites. The data is then presented in an easy to digest form showing how many people had positive and negative experience with Zendesk. With that information at hand you should be equipped to make an informed buying decision that you won’t regret.